Select  in main menu if you want add all of it. You can now enter negative values in all *sprite* data fields except data4 one. The negative values is used by new GDX types. Vanilla hidden types that was previously able to be added in 2D mode list is temporary unavailable as they not compatible with GDX types yet. I will try make 'em compatible in next PMAPEDIT update, so stay tuned. Fix for "Different sky for each sector". Freezes and hangs now should be solved. Please, let me know if you have any problems. Extract contents of archive to Blood folder. Select what you want to be patched by keypress. This patch unlocks several features, such as hidden commands, types and allows to apply palettes on monsters and things. It also adds active unused items in sprites menu list and new traps in hazard menu if hidden types was selected to unlock. The patch changes several bytes to remove some checkings in AutoAdjustSprites() function that called by MAPEDIT every time you change something in map (for example if you put tagged sprite or decoration sprite using one of reserved picnums that uses for ammo or monsters). 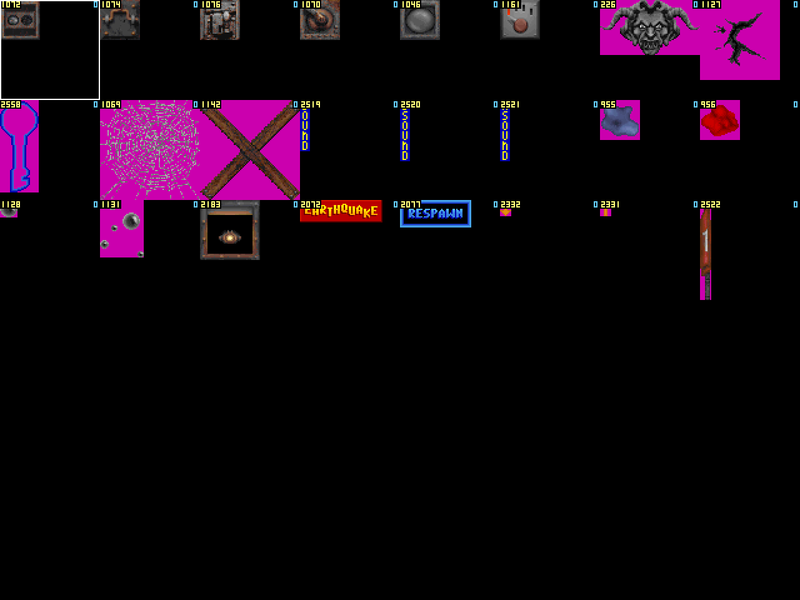 The function works as database; it contains pre-defined info such as statnum, size, type, picnum and palette for each tagged sprite. 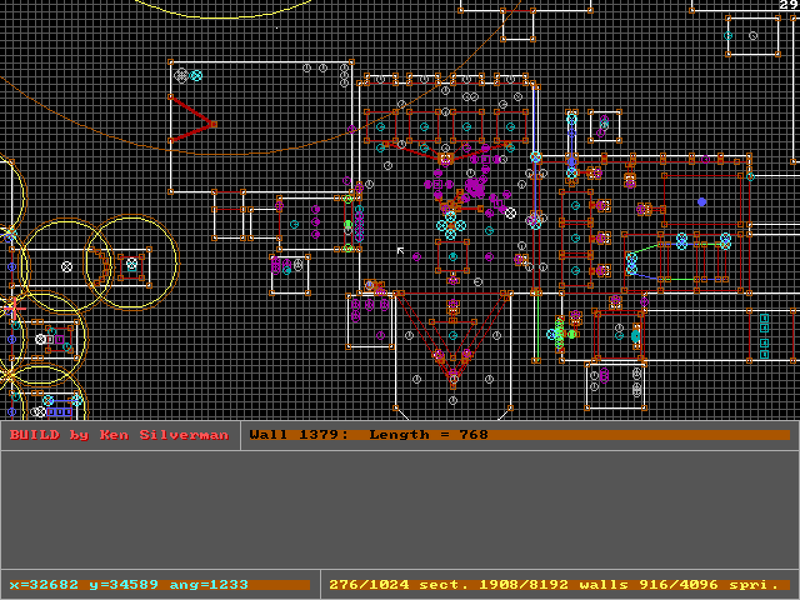 Once sprite from database inserted in map, function will set all necessary info for it. Please see PMAPEDIT.TXT as it contains important information and examples of usage! Most of new types (lo-tags) working just like their named counterparts, so you probably wont messed up with setting them properly. You basically only need to know Types and Status number lists. 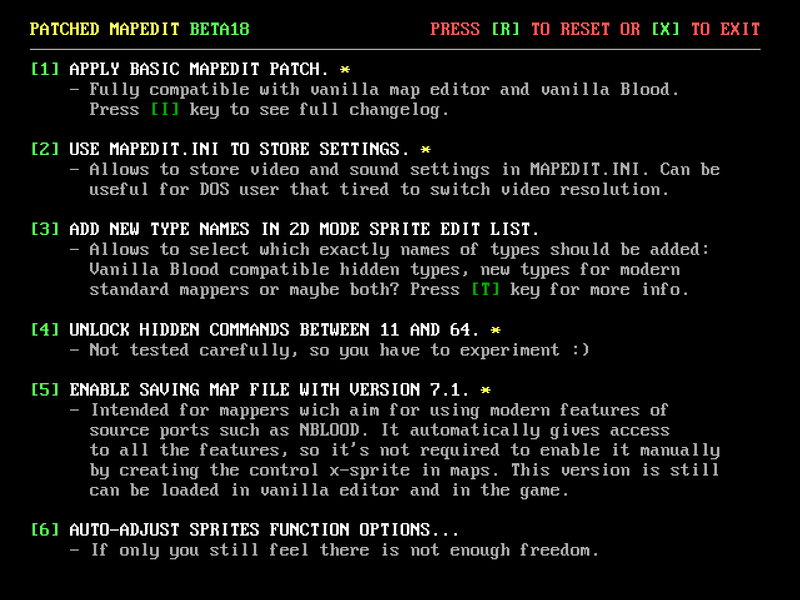 See them in PMAPEDIT.TXT. New types also fully accesible for RX\TX system - this means you can send and get commands. You still not able to select new Types from sprite properties dialog in 2D mode (except ones that can be added) as they have no name, however you can set it by pressing ALT+T on sprite.See examples in right panel of this site or in PMAPEDIT.TXT. If you apply palette to monsters, that palette will be inherited in burning and electrocuting animations. Let's say you apply palette 5 to axe zombie to make it look like stone, when zombie will burn, you will got grey flame. To fix it you have to edit SEQ files of monsters in SEQEDIT (you will need to set neutral palette such as 3 or 13). To have ability to make enemies that have different sizes you also need edit it's sequence files using SEQEDIT: you will need set XR and YR to 0. Use numpad 4,6,2 and 8. Dont forget rest XR and YR in each frame of sequence. Exceptions: Tchernobog - it already have X and Y size equal to 0. The unlocked commands between 12 and 64 mostly useless to use them in map, altrough you can force some items to beign pickuped remotelly. Apply "Disable sprite palette auto-adjusting" patch. Insert enemy sprite (with no palette). In 3D Mode add any palette you wish, save the map. In Blood you will got monster with selected palette. Apply "Unlock hidden types (lo-tags)" patch. In 2D mode press ALT+F6 on it and select type 228. Optionally you can fill "drop item" field and select key to drop. Apply palette, if you have palettes patch installed. In Blood you will got painted 1-dead head cerberus that can drop items and keys after death. To make it not ignore the world, just set it's State in mapedit to 1, or enable him via remote control as he fully accessible for RX\TX system. In 2D mode press ALT+F6 on it and select type 431. Mark "Proximity" flag, optionally also "Push" and "DudeLockout" flags. In game you will got dropped life leech turret that fires in monsters and sometimes can even fire in you. If you marked "Push" flag it will able to pickup via key press. Apply "Unlock hidden types (lo-tags) patch". In 2D mode press ALT+F6 on it and select type 420. In game you will get armed spary can bomb. Once damaged it will explode. If you want it explode via remote control, you probably want add RX\TX values. You may also set "Proximity" flag and it will explode when you or monster get close enough. Mark "Push" to make it explode via key press on it.